I recently wrote about RemoteIE which is a tool created to help developers on non-Windows OSâ€™es to test for Microsoft Edge and Internet Explorer 11. It uses Microsoftâ€™s RemoteApp virtualization software to create a browsing session without the need to install a VM. Developers have been sending us a lot of requests to expand it out to other versions of IE. One of the big limitations, though, is the fact that you canâ€™t access resources or sites locally hosted on your development machine. This is a cumbersome limitation and narrows the usability of the tool for testing. Itâ€™s been nagging at me for awhile that we couldnâ€™t use this in this fashion, but this past week I found a solution that I wanted to share. 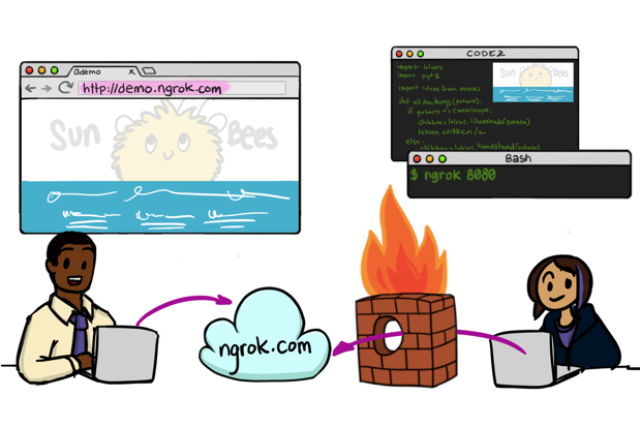 Enter ngrok, a very cool, lightweight tool that creates a secure tunnel on your local machine along with a public URL you can use for browsing your local site. When ngrok is running, it listens on the same port that youâ€™re local web server is running on and proxies external requests to your local machine. This was the secret sauce I was looking for to allow RemoteIE to be able to test local sites on my Macbook. Getting it to work was simple. ngrok comes as an archived download and extracting it gives you the actual app. You need to decide where to place it. In my case, I moved it to /usr/local/bin which is where I prefer to keep my non-OS executables. You can place it anywhere as long as itâ€™s available in your path or your symlink it. Dropping â€œhttp://5057493e.ngrok.ioâ€� or â€œhttps://5057493e.ngrok.ioâ€� (SSL) into your browserâ€™s address bar should now bring up your local site. These are unique URLs that are created each time you restart ngrok making it easy to share these out for one-time testing sessions across a team. The benefit to this, of course, is that youâ€™re now able to use RemoteIE with these public URLs to load and test your local site since to the service, your local site now looks like a staged or production website. Weâ€™ll continue to work on making RemoteIE easier to work with but for the time being this is a solid solution for getting around this limitation of the service. My teammate Christian Heilmann tweeted about ngrok for testing Microsoft Edge via a VM. Perfect timing since it also kickstarted some replies with alternatives. 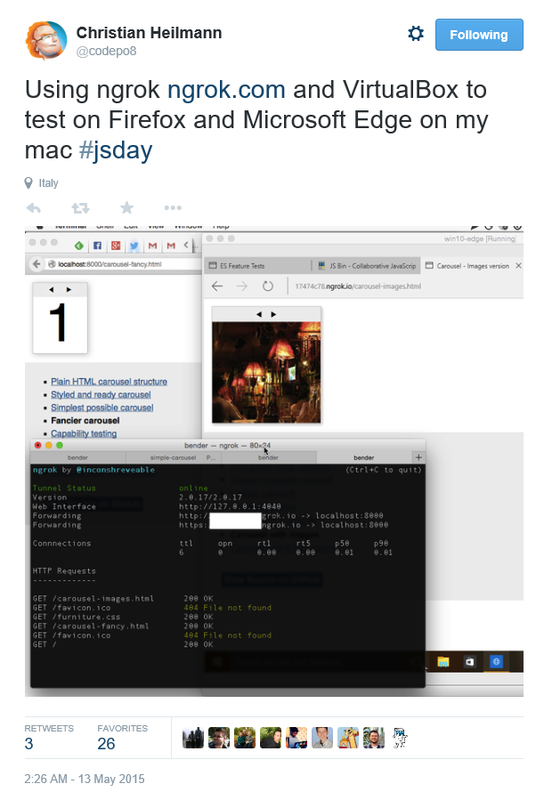 Woah, I can test Microsoft Edge & IE on a Mac & Linux! And some free tools: Visual Studio Code,Azure Trial, and cross-browser testing tools â€“ all available for Mac, Linux, or Windows.